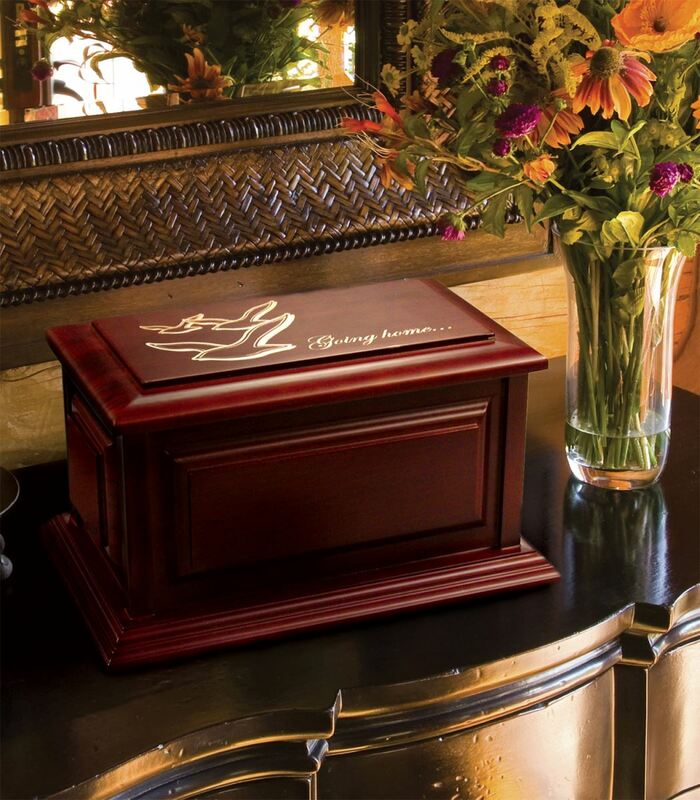 Crescent has developed a ‘state of the art’ Department of Engraving and Design with the ability to customize and produce products such as Life Print Memorial Keepsakes™, a complete line of urns, keepsakes, flag cases, candles, and a complete line of jewelry. Crescent understands that the celebration of a loved one’s life is one of the most important events for the family and that it should be beautifully memorialized. 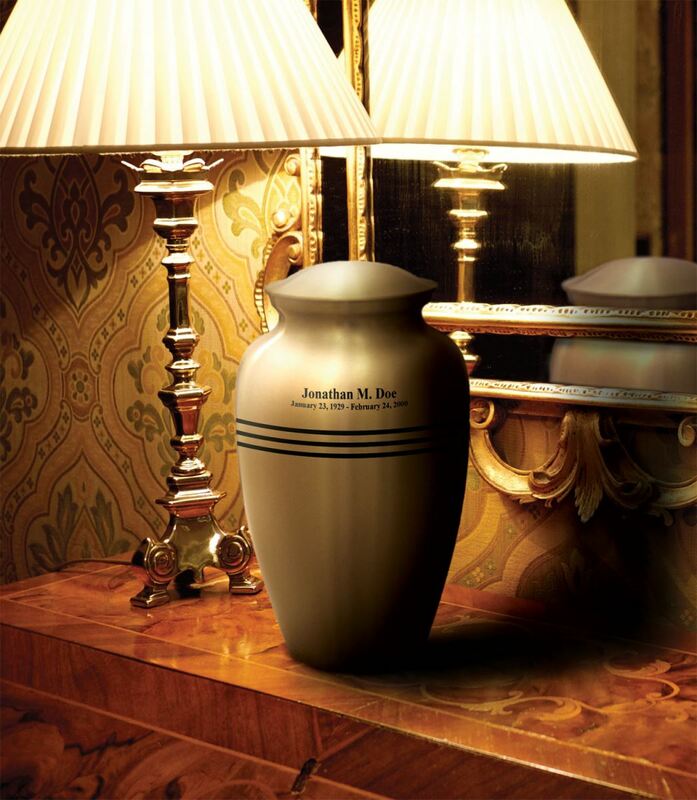 We understand that a funeral home often needs customized product quickly or perhaps even the next day. Crescent can guarantee many items to deliver the next day. Working in the Department of Engraving and Design are creative experts that have completed a rigorous training program and have a true appreciation for quality workmanship. They make and customize every product with the understanding that it will memorialize the life of someone so loved. Below are examples of the four types of personalization that are available through Crescent; a Stock Engraving, a Custom Engraving, a Photo Engraving and a Photo Painting. Crescent offers a wide selection of stock engravings for the family to choose from so you can customize your loved one's memorial. The image to the right shows a beautiful solid wood, cherry finish Colonial Urn engraved with the stock image, "Going Home." 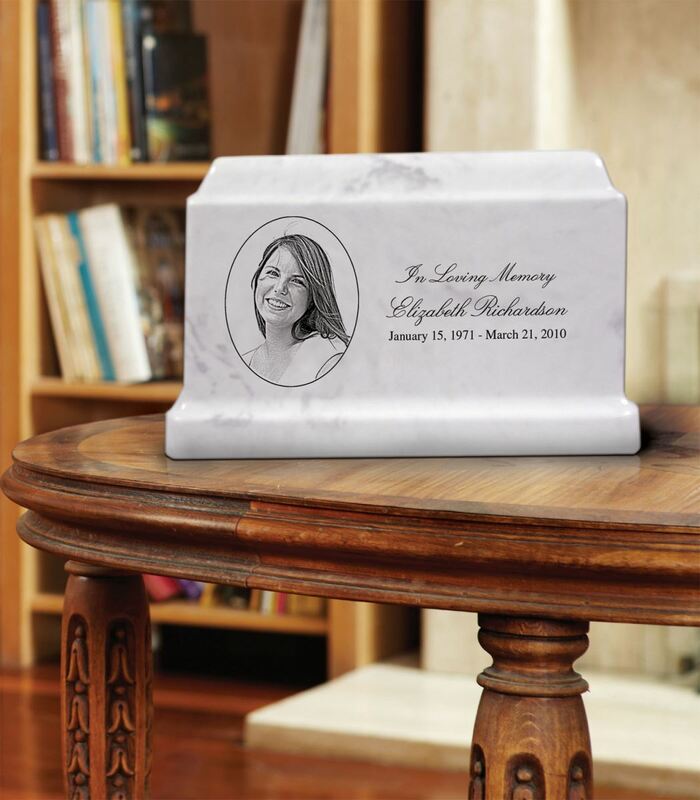 There are limitless design options to customize your loved one’s memorial. To see all of the stock engravings that Crescent offers, please Click Here to view a digital PDF document that showcases all of Crescent's stock engraving designs. If for some reason you do not see a stock engraving design that meets your specific needs Crescent will customize your urn with the perfect engraving image to memorialize your loved one. This type of engraving falls into Crescent's Custom engraving category which is described and shown below. Not only does Crescent offer many different stock engravings, but you may also choose to further customize your loved one’s memorial with their name, birth date, death date, and any other custom text you wish to have engraved. Each specific urn has engraving restrictions regarding size and length; however, the custom combinations are limitless with Crescent engravings. The image to the right shows a beautifully engraved urn from Crescent's Brass Collection; The Classic Gold with Stripes. It is custom engraved with the name and date of a dear loved one’s life well lived. With a custom engraving you can have both a stock engraving and add almost any text you wish to have on your loved one's memorial. By using a clear photograph of your loved one and modern technology, Crescent can customize any of the following urns with a photo engraved image of your loved one: The Crescent Marble, The Crescent Marble Keepsake, The Crescent Marble Companion, Pearl Onyx, Cultured Granite, Beveled Outside Solid Granite Marker, Flat Outside Solid Granite Marker, Solid Granite Cremation Monument, The Colonial, The Pioneer, Memory Chest, The Belmont, and The Tribute Scattering Urn. With a custom photo engraved urn, you can also add custom text. The image to the right shows a stunning white Crescent Cultured Marble Urn with a photo engraving and custom text. The beautiful photo painted process adds a full-color overlay that is directly printed onto the urn. Crescent simply takes a photograph of your loved one and combines it with one of our full-colored backgrounds. Although durable and lasting, photo painted urns are designed for an interior placement. 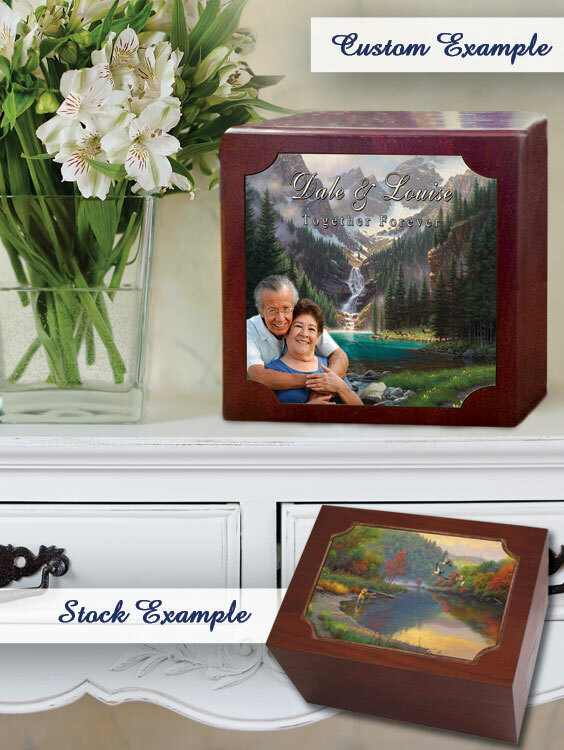 The image to the right shows a Custom Photo Painted example on a Cherry Wood Companion Urn with the Lake Solitude Background. It also shows the stock Fly By background photo painted onto a Belmont Urn. To see all of the stock photo painting backgrounds that Crescent offers, please Click Here to view a digital PDF document.